Simple, and a great competitive price, great experience, many thanks. Geoff - Easy Life! Simple & straight forward, fair policy costs, just what I was looking for... and I hate filling in forms... don't you? Compare Boat Insurance is designed with you in mind. Our online quotation system gives you instant access to quotes from a panel of top UK insurers. It's easy to find the right blend of price and features on our user-friendly site. Buy your policy with confidence. We have ten years of experience in marine insurance so you can be sure that you're in safe hands, just like the thousands of customers who have already entrusted their boat insurance to us. As the first UK boat insurance comparison website, we provide outstanding policies at very competitive prices. Tired of filling out endless forms? At Compare Boat Insurance, all it takes is the click of a button and you'll have the cover you need in matter of minutes. Our aim is to provide you with the highest standards of cover at the most competitive rates. All of our policies include up to £3 million third party liability insurance as standard and our personal accident cover insures you and your passengers for up to £1,000 in emergency medical expenses per incident. 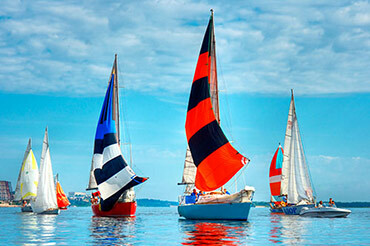 Here at Compare Boat Insurance, we offer comprehensive cover for a wide range of watercraft including: yachts, cruisers, motorboats, speedboats and narrowboats as well as smaller crafts such as RIBs, canoes and kayaks. We even provide specialist insurance for fast-fishers. Check out our latest live customer reviews where other boaters tell us what they really think. Easy site to work with and easy to understand, for someone that has never done this before. A simple process with basic and relevant questions, will use again and would recommend. Easy to fill out application form Instant cover and inclusive cover for my Dinghy tender. Why keep photographic records for insurance purposes? Using digital cameras or even smartphones it's now easy to keep photos to record your let property portfolio - but why do should you do this for insurance? What security devices can I use on a trailered boat? What are the security devices you can use to prevent thieves making away with your pride and joy? We take a look at the various options open to boat owners. Where's the best place to store your boat? We look at the options for all sorts of craft whether they are trailered, moored or stored out of the water. We're all familiar with the terms 'new-for old' and 'market value'. Do they still apply in the world of boat insurance?